"A striking literary debut of love and mortality perfect for fans of quirky, heart-wrenching fiction like Nathan Filer, David Nicholls and Rachel Joyce. And he still has one thing left to do..."
This is an impressive debut from James Hannah, who has an incredible way of bringing Ivo's final weeks to the page. The story is told, essentially through memories as well as the present day after Ivo's nurse suggests he play the A to Z game, where you think of a body part beginning with each letter of the alphabet and tell yourself a story associated with that body part. This game is exactly how we learn all about Ivo's past and how he has ended up where he is and the person he is today. Despite the disjointed nature of this way of imparting the story, it works very effectively. The stories that come out of each body part are not directly linked and they do jump around but somehow as a reader you manage to latch on to the strong thread which links everything and ultimately all the other side threads become one and everything becomes clear. I liked the sentimental aspect which came from the blanket which Ivo has with him, and on that note, watch out for something special from the publishers around the date of publication on 12 March 2015. 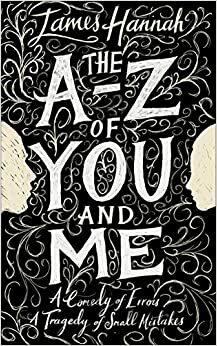 The A to Z of Me and You certainly does have echoes of a Rachel Joyce book (The Unlikely Pilgrimage of Harold Fry) and also Rowan Coleman (The Memory Book). Thank you to the publishers, Doubleday, for the advanced copy of The A to Z of Me and You in exchange for my honest review.